We are happy to announce the first edition of the Western Illinois University String Festival, on November 11, 2017! 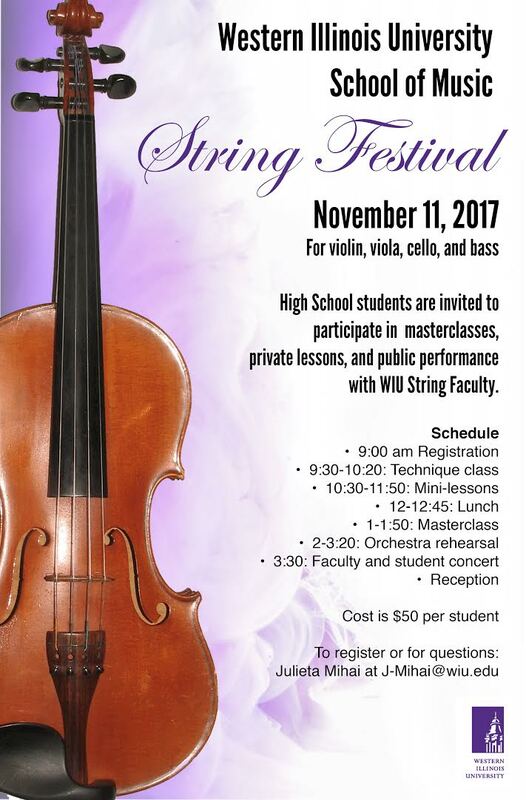 High school students are invited to participate in a masterclass, private lessons, and a public performance along the WIU string faculty. The four categories, violin, viola, cello and bass are separate during the morning session. The students will have the opportunity to work individually with each of us on their own repertoire. We will meet in the afternoon for a masterclass, rehearsal and concert! For registration and questions, please contact Julieta Mihai at J-Mihai@wiu.edu. The registration should include: name, address and telephone, email address, previous playing experience, date of birth, registration fee.